Grace Wales Bonner has previously talked about her brand as being a “multiplicity of voices” – not a singular voice, as many brands are. She talks about her label, now in its ninth season, as being like a world which she is continuously inviting people in to populate. This approach is on display, quite literally, at her Serpentine exhibition which opened last month. There, she has created a “research shrine” filled with voices who, like her, take interest in ideas of ritual, magic and mysticism originating from West Africa and the Caribbean. 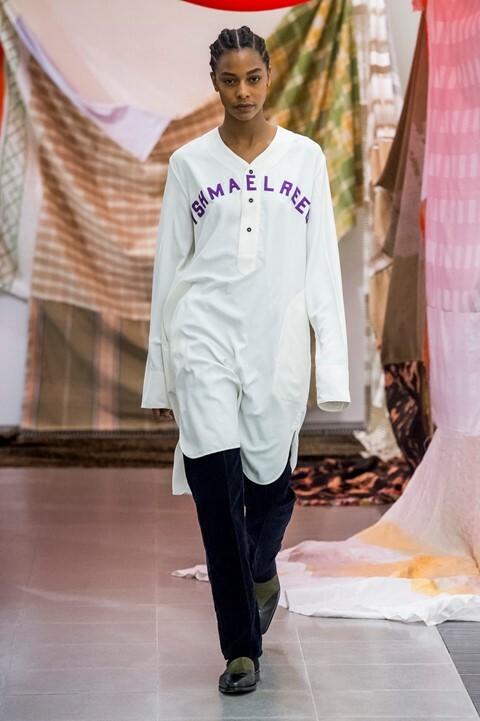 It was – among works by Ben Okri, Eric N. Mack, Rashid Johnson, Kapwani Kiwanga, David Hammons and Liz Johnson Artur – that she staged her A/W19 collection last night, in an environment that was, in the truest sense, curated. The show – beautiful and elegant, as ever – demonstrated “multiplicity of voices” in the clearest way yet. The great American author and musician Ishmael Reed travelled from Los Angeles to play a jazz composition on the piano, while Nigerian writer Ben Okri recited a poem that he had written especially for the designer. These literary figures, who she described backstage as “as oracles or shamans, whose writing connects back to spiritual origins of the Afro-Caribbean diaspora,” laid the foundation for the collection, which represents Wales Bonner’s take on American college style – imbued with a sense of magic originating from African spirituality. Here, in the wake of the show and speaking in her own words, Wales Bonner expands on the story behind this collection, Mumbo Jumbo. “It’s exciting to be showing in the Serpentine space. It’s interesting to have been able to develop this environment and be aware of it from such an early time in the collection’s development. And I think it’s exciting to be able to present in an environment that explains the thinking behind the collection. Eric Mack [who features in the exhibition] has been working on fabrics for the collection so it’s quite integrated. “This season, I’ve been thinking about black intellectualism as a form of spirituality. I’ve been looking at a lot of university dress – particularly collegiate clothing and Howard University in the 80s. I looked at a lot of yearbooks from that time, identifying key elements from that wardrobe. So it’s referencing very recognisable clothing – American college – but trying to imbue that with a sense of magic that originates from African spirituality; imbuing something that’s very classic and American and with a sense of language and culture that comes from somewhere else. “The collection is about a meeting point between these artists, a connected spirituality, and these intellectuals that are connecting to a different kind of lineage and having those two ideas in dialogue with each other. But also in the Serpentine exhibition I was thinking a lot about writers and oracles and the work of Ben Okri and Ishmael Reed and I’ve also been looking at writers and the way that they dress – about how a language can be part of a collection as well. So that’s been quite a direct reference point.